Software component vendor ComponentOne has released Studio Enterprise 2013 v2.5, the latest in its suite of components, with support for Windows 8.1 and Visual Studio 2013. The piece that caught my eye is the TouchToolkit for Windows Forms. Here’s the problem. 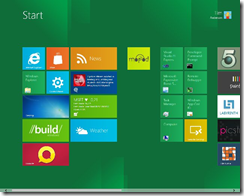 The Windows desktop is poor with touch control, which is why Microsoft created Windows 8 with its alternate, touch-friendly Windows Runtime platform. However users are resistant to the changed user interface, and it does not help with existing desktop apps. Developers are also faced with a question of simple mathematics. Develop a Windows 8 Store app, get a market of x. Develop a Windows desktop app, get a market of many times x, since Windows 8 can run desktop apps, but Windows 7 cannot run Store apps. Embarcadero approached this problem with a framework called Metropolis, for Delphi and RAD Studio. It builds apps that mimic the Windows Runtime look and feel, but which are actually desktop apps. Of course they do not run on Windows RT, the ARM version. It is a confusing solution in my opinion, leading users into what Martin Fowler calls the Uncanny Valley, where stuff works almost but not quite how you expect. I prefer the thinking behind the TouchToolkit. 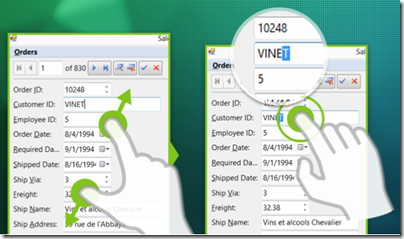 Take your existing Windows Forms apps, or write a new one, using these controls to make them more touch-friendly. They will never be as well suited to touch control as a Store app, but they might be good enough, and of course will run on Windows 7 and earlier versions. The controls include a magnifier, support for zoom gestures, and a touch event provider that adds gesture support to any control. Windows Forms, we all know, is not as good as WPF if you want an application that scales nicely and supports modern design. 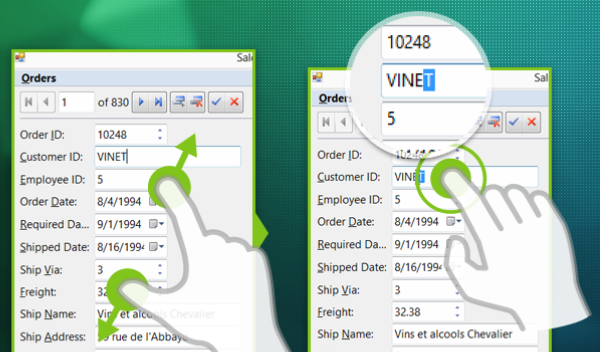 On the other hand, Windows Forms is pragmatic and easy to use framework that remains popular for line of business apps. Embarcadero has released C++ Builder XE3, the first version built on the open source clang front end for the LLVM compiler. This has enabled the product to support many new features, including extensive C++ 11 support and a 64-bit compiler. While it is a shame that the old Borland C/C++ Compiler is no more, it makes sense for Embarcadero to bring its VCL (Visual Component Library) and FireMonkey framework to Clang rather than continuing to work on its own compiler. The other big change is cross-platform support. 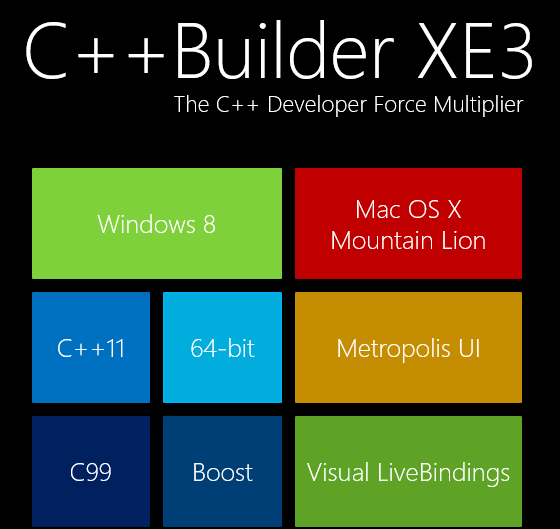 Through FireMonkey, C++ Builder XE3 supports Windows (including Windows 8) and Mac OS X, with iOS and Android promised for 2013. Although Windows 8 is supported on the desktop, there is no official support for the Windows Runtime (Windows Store apps). Instead, Embarcadero has a curious application framework called Metropolis which fakes the Windows 8 style but with desktop applications, as if the Windows 8 world were not already sufficiently confusing. The big question is how compatible VCL applications created for earlier versions of C++ Builder are with the XE3 release. With a new compiler and major changes to the VCL in order to support the new compiler, you might expect some issues. I would rather hear that from developers though, rather than from Embarcadero. Although C++ Builder is a cross-platform compiler, it only runs on Windows. A common scenario is to run in Windows emulation on a Mac, using VMware Fusion or Parallels. Similar changes are on the way for Delphi, which uses the same VCL and FireMonkey frameworks but with the Delphi language based on Object Pascal. Note that the new Clang-based compiler is 64-bit only. You are meant to continue using the old Borland compiler for 32-bit, making it hard to maintain a single code base for both. aQuantive may be Microsoft’s biggest acquisition failure. Have there been good ones? A look back. Today’s news that Microsoft is writing off $6.2 billion from the useless acquisition of aQuantive in August 2007 gives me pause for thought. How bad is this company at acquisitions? 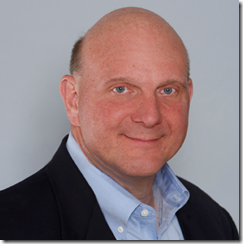 Particularly those under CEO Steve Ballmer’s watch. He became CEO in January 2000. Microsoft acquired Danger in February 2008 for $500M. Small relative to the aQuantive acquisition, but how much further money did the company burn transforming Danger from an excellent cloud and mobile company to the group that came up with Kin, the phone withdrawn from the market after just two months on sale? Not to mention the downtime and threatened loss of data suffered by Danger’s online service under Microsoft’s stewardship. Microsoft attempted to buy Yahoo for $44.6bn in 2008. Yahoo’s executives declined, a move that was (very) bad for Yahoo shareholders but quite possibly right in a business sense; it would not have been a good fit. Microsoft acquired Groove Networks complete with Notes inventor Ray Ozzie in March 2005. I put this in the disaster category. Groove went nowhere at Microsoft. Ozzie became Chief Software Architect and talked of internet vision but did not deliver. The wretched SharePoint Workspace is apparently based on Groove. What about the good ones? My view is that Microsoft paid too much for Skype at $8.5 billion but at least it acquired a large number of users and has some chance of enhancing its mobile offerings with Skype integration. Microsoft acquired Bungie in 2000 and given the success of Halo (without which, maybe, the whole Xbox project might have faltered) we have to count that a success, even though Bungie was spun off back to independence in 2007. Other notables include Great Plains in December 2000 (now morphed into Dynamics ERP); Connectix in February 2003 which got Microsoft started in virtualization; and Opalis in December 2009 whose software now plays a key role in Microsoft’s System Center 2012 private cloud software. Winternals in July 2006 was a great acquisition. Microsoft acquired some indispensable Windows troubleshooting tools, and also Mark Russinovich and Bryce Cogwell, able people who I suspect contributed to the transformation of Windows Vista into Windows 7, and in the case of Russinovich, to the technology in Windows Azure which now seems reborn as an excellent cloud platform. You can see all Microsoft’s completed acquisitions here. I install a ton of pre-release and test software so it is not surprising that I sometimes run into Windows Installer issues. Here is an entertaining error though. It is unlikely, I guess, that you will hit this problem; but I present it as an illustration of what can go wrong, as we move into the era of locked-down operating systems and easy app installs. Though even these are not perfect. Notice how the operating system fights me all the way. After presenting this information setup closed and the application was not uninstalled. So … the application does not support Windows 7 and therefore you cannot remove it. Clever, and I found this a tricky problem to get around. I took a look at the Windows installer files which you can find in %SYSTEMROOT%\Installer. All the msi files have random names. 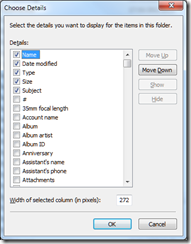 However, you can right-click the column heading area and choose More, then check Subject in the list. Click OK, and now the application to which each msi relates appears. Now you can click the column heading to sort by subject and find the problem msi. I copied the msi to my desktop. 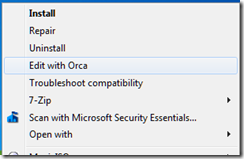 For the next step you need the Orca tool from the Windows Installer SDK. 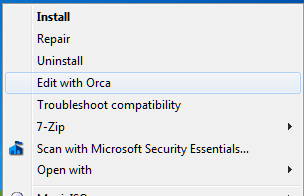 If Orca is installed, you can right-click the MSI and choose Edit with Orca. I then selected LaunchCondition and deleted the launch condition that required Windows XP. Now right-click the msi and choose Uninstall. OEMs are still breaking Windows: can Microsoft fix this with Windows 8? Mark Russinovich works for Microsoft and has deep knowledge of Windows internals; he created the original Sysinternals tools which are invaluable for troubleshooting. My mom recently purchased a new PC, so as a result, I spent a frustrating hour removing the piles of crapware the OEM had loaded onto it (now I would recommend getting a Microsoft Signature PC, which are crapware-free). I say frustrating because of the time it took and because even otherwise simple applications were implemented as monstrosities with complex and lengthy uninstall procedures. Even the OEM’s warranty and help files were full-blown installations. Making matters worse, several of the craplets failed to uninstall successfully, either throwing error messages or leaving behind stray fragments that forced me to hunt them down and execute precision strikes. I admire his honesty. What he is describing, remember, is his company’s core product, following its mutilation by one of the companies Microsoft calls “partners”. As my cleaning was drawing to a close, I noticed that the antimalware the OEM had put on the PC had a 1-year license, after which she’d have to pay to continue service. With excellent free antimalware solutions on the market, there’s no reason for any consumer to pay for antimalware, so I promptly uninstalled it (which of course was a multistep process that took over 20 minutes and yielded several errors). I then headed to the Internet to download what I – not surprisingly given my affiliation – consider the best free antimalware solution, Microsoft Security Essentials (MSE). Right. I do the same. However, the MSE install failed, probably thanks to a broken transfer application used to migrate files and settings from an old PC, and it took him hours of work to identify the problem and complete the install. What interests me here is not so much the specific problems, but Microsoft’s big problem: that buying a new Windows PC is so often a terrible user experience. Not always: business PCs tend to be cleaner, and some OEMs are better than others. Nevertheless, although I have had Microsoft folk tell me a number of times that its partners were getting the message, that to compete with Apple they need to deliver a better experience, the problem has not been cracked. There is something about the ecosystem which ensures that users get a bad product. It goes like this I guess: customers are price-sensitive, and to get the price required OEM vendors have to take the money from malware companies and others desperate to drive users towards their products. Yet in doing so they perpetuate the situation where you you have to buy Apple, or be a computer professional, in order to get a clean install. That describes a broken ecosystem. Microsoft’s Signature PCs are another option, but they are only available from Microsoft stores. The next interesting question is whether Microsoft can fix this with Windows 8. It may want to follow the example of Windows Phone 7, which is carefully locked down so that OEMs and operators can add their own apps, but their ability to customise the operating system is limited, protecting the user experience. It is hard to see how Microsoft can achieve the same with the x86 version of Windows 8, since this remains an open platform, though it may be possible to insulate the Metro side from too much tinkering. Windows 8 on ARM, on the other hand, may well follow the Windows Phone pattern. Now, Microsoft charges OEMs far less for Windows Phone licenses (about $15 per unit) than for full-on Windows licenses (on average, working out to about $56 per unit) … But for Ballmer and the team, this is the bad news scenario. Only $15 per licence? And even less in profit? Compared to $37 in profit? It’s a money-loser, people. While I agree that Microsoft has a problem with its business model in the new world of mobile devices, I do not follow this reasoning. There is nothing to stop Microsoft charging more for Windows Phone OS on tablets than on phones if it could get away with it. Nor is it necessarily true that Microsoft will succeed in charging as much for Windows 8 on tablets as it does for Windows 8 on PCs. In fact, that is unlikely to be be true; they will be cheaper, especially on ARM. If it is not this then, that still leaves the question of why Microsoft has not licensed the Windows Phone 7 OS for tablets. Microsoft has undoubtedly fumbled tablet computing and this was a costly mistake. Nevertheless, it is a company capable of strategic thinking. I think it goes something like this, in no particular order. First, I reckon Microsoft is thinking beyond the initial OEM license income for its profits from Windows 8 tablets. 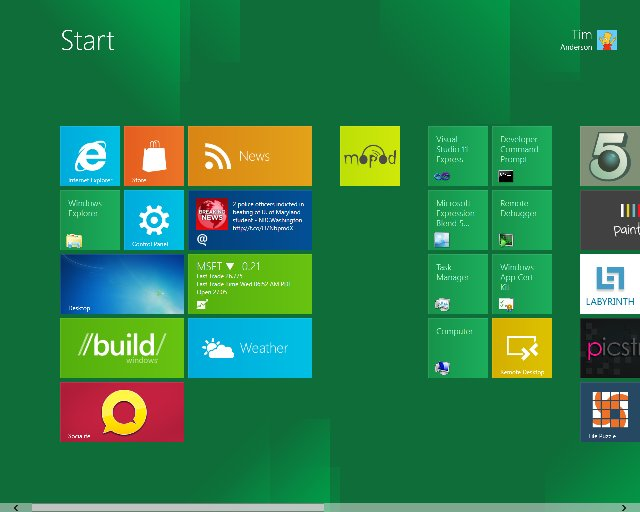 It is all about the apps – 30% of the income from every app sold on the locked-down ARM edition of Windows 8. Apps tend to be cheap, and there is cost in running the store, but there is potential for ongoing income that will exceed the initial license sale. Especially if, like Apple, Microsoft insists on a cut of subscription income, in-app advertising income, and so on. Second, Microsoft is also betting on cloud computing. Windows Phone 7 is marketed mainly as a consumer device, but Microsoft is going to play the “this is the device for professionals” card at some point. You can bet that Windows 8 tablets, and their successors, will be promoted as the ideal client for Office 365, as well as for on-premise Exchange, SharePoint and Lync. Sell a tablet, buy a customer for Office 365. Lock customers into Office 365, and sell them other cloud applications and services. Plenty of opportunity for profit. Third, my guess is that the Windows team at Microsoft does not consider the Windows Phone 7 OS good enough to be the foundation of its future mobile platform. They respect it enough to borrow its Metro design language, along with many aspects of the development model, but in the end Sinofsky and his team were not willing to hand over the future of Windows on devices to Windows CE and Silverlight. What we are getting with the forthcoming Windows Runtime is a more deeply thought-through new platform in which .NET, native C++ code, and HTML 5 are equally well supported, and in which developers are forced to use asynchronous APIs that keep the user interface responsive. It will be a better app platform than the current Windows Phone OS; in fact, I fully expect Windows Runtime to migrate to the phone in some future version. If Microsoft had allowed Windows Phone 7 onto tablets, it would have the difficult task of explaining to its customers how Windows 8 tablets differ from Windows Phone OS tablets as well as from those old Windows tablets from Bill Gates days. Therefore Microsoft took the decision to wait until Windows 8 was ready. That was a bold decision, and it may be too late, but the reasoning is plausible. Recently I tried to sign into Live Messenger on Windows 7, only to be informed of what appears to be a temporary interruption in service. The help document says that the solution is to reinstall Windows Live Essentials. I confirmed this, not by reinstalling (yet), but by trying Live Messenger on another machine, where I could sign into the same account successfully. The error message is incorrect, since the error is apparently on the client whereas the message states it is a temporary problem with the service. Microsoft’s engineers know that the error message is incorrect, since the help document references both the message and the solution. The error message has been incorrect for years, since it applies to both Windows Live Messenger 2009 and 2011. The misleading error message is particularly annoying, since if the user wants to use Live Messenger urgently they may well wait as advised by the message, not realising that the problem can be fixed immediately. The solution is a brute-force one that involves many other applications, including Live Mail and Live Writer (on which I am typing this post). Or is it enough just to reinstall Messenger? The message suggests not. However if you use Live Mail for all your email, you probably want to know whether the uninstall will delete all your email and contacts or not. The referenced article on uninstalling Live Essentials does not say. Give an accurate error message. Give a solution which targets the exact problem rather than relying on an uninstall/reinstall procedure that changes many things that are working fine. If this is impossible, at least advise the user in one place concerning their obvious questions, such as “what happens to my stuff”. Update: I found the cause of this problem. A developer tool beta had overwritten my system path with its own, breaking this among other things. I do not blame any application for breaking in these circumstances. I fixed the Live Messenger problem by performing a Repair on Live Essentials – less risky than uninstall/reinstall, and in this case sufficient. Another idea if you have this kind of problem is System Restore. Nevertheless, the error message could do with some work! 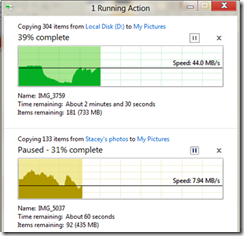 Microsoft’s Windows chief Steven Sinofksy has posted details of what file operations look like in Windows 8. There are a few changes, including a consolidated view of all current file operations that lets you pause and resume any of them. You can also click for more details and get a pretty graph. Microsoft has also worked on the conflict resolution dialog, the one that says “Copy and Replace”, “Don’t copy”, and “Copy, but keep both files”. I consider this a pretty good dialog, but the new one adds the ability to inspect the actual files or even open them to check which is which. A few observations. First, file operations are hard to get right from a usability perspective. I guess we have all had the experience of trying to help a non-technical user over the phone with some operation like, say, downloading a zip file, extracting it, and doing something with the contents. A common problem is that the user cannot find what they downloaded. Then they are not sure whether they did download it, and do so again. Then they get confused by the ZIP file, which mostly behaves like a folder in Explorer but is not quite the same; and of course since Windows XP SP2 all downloaded files are “blocked” by default which is another source of perplexity. 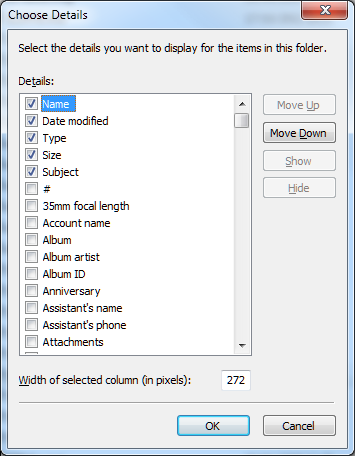 If you add complications like hidden folders and hidden file extensions in Windows Explorer, what should be a simple task can be really awkward. Let’s say your user has a video file called somemovie.vob that needs to be renamed to somevideo.mpg before it will play. With the default setting, when you rename it you actually get somevideo.mpg.vob. You have to talk the user through showing file extensions before it will work, or maybe open up a command prompt and use ren which does actually work correctly. Microsoft could fix this with a “Change file extension” option in Windows Explorer, but I do not know if this has made it to Windows 8. The problems with hidden files and hidden file extensions show that something is wrong with the underlying model. Showing them is wrong because they are ugly and confusing; hiding them is wrong because you sometimes need them. It is a partial abstraction that is only partly successful. Apple’s solution in iOS is to hide the file system completely. The user will never have these problems. However, this is an autocratic approach that introduces new difficulties. If you have a documents in Pages in iOS you cannot move it directly to DropBox, for example, because there is no accessible file system. You are limited by whatever options the Pages app gives you for doing something with a document. I believe thought that Apple is on the right lines. The app-centric view makes sense to users, and abstracting the file system so that users do not generally need to care about the location of a file is a reasonable goal. If the File Explorer goes the way of the command prompt, and becomes a tool used rarely by most users, that will mean Windows usability has improved. Cloud-centric computing has potential to improve this, with your local storage just a cache of your internet-stored documents and data. 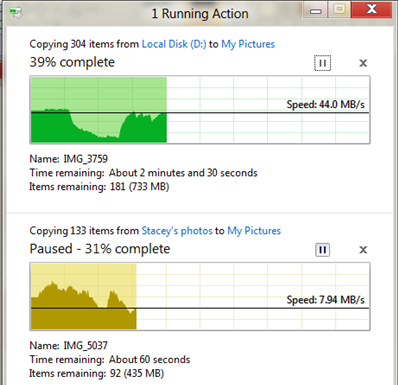 Finally, it is worth noting that file operations have got significantly better in Windows. Using the clipboard to copy and paste files, which I think came in with Windows 95, was a big advance. Then Vista fixed another annoyance: multiple file operations would abort on the first failure, leaving you uncertain which files had actually been transferred. Vista broke performance though, and file operations could be hilariously slow as Windows “discovered” files or just seemed to hang with a spinning bagel. Service packs and then Windows 7 pretty much fixed that. I still like ROBOCOPY though. Hey Microsoft – why doesn’t Explorer have “Copy new and changed files only” or “Mirror directory”?